This was on the staff recommends shelf at Midtown Comics in New York, and I do like a good staff recommendation. Plus the artist is female, and I was on the hunt for some female representation on our comic shelves. Rocket Girl has a fairly complex plot, which I suspect will get easier to follow in later volumes, although maybe not. DaYoung Johansson is a detective in the New York Teen Police Department in an alternate-reality 2013 who is sent back in time to 1986 to investigate shadowy but all-powerful Quintum Mechanics for “crimes against time”. There’s some twisty time-loop who-did-what-when stuff going on and some action-adventure chase sequences, but what I found more interesting was the culture clash DaYoung faces. Almost exactly a year ago I went on what I hope will be the first of many trips to Persephone Books in London and, as well as being bought a book by my lovely friend H, I bought this book for myself on the back of several glowing reviews I had read around the internets. I can now add to all the glowing praise with some of my own! Melanie is a young, bubbly wife and mother recovering from a serious bout of TB in the 1950s. After being confined to her bed for eight months, she is thrilled when the doctor says she can be moved to another room, where she is lain on the Victorian chaise-longue, which she bought on a whim while pregnant but has never before been able to use. When she falls asleep in the afternoon, she wakes up in what appears to be not only another house but another time, almost a century earlier, in the body of someone called Milly, the only thing in common being the Victorian chaise-longue, or so she thinks at first. I liked the way Laski dealt with time travel, answering some of the key questions that always come up with her own (possibly unique?) solutions. For instance Melanie can’t say anything out loud that doesn’t fit with the time and place – there’s a disconnect between what she intends to say and what comes out. But Laski also leaves Melanie to puzzle over some of the other time-travel issues, such as how the timeline works: has all this happened before? is this an alternative past? what is time doing in her present? She rejects outright the idea that this is a previous incarnation of herself, which leaves her with the creepy knowledge that if this is real, all the people she is interacting with, including Milly, are long dead in her own present. I thought Melanie was a great character, full of life and realistic frustration that just as she is recovering from her near-death and is ready to enjoy her husband and child, she is spirited away to some puzzling situation in someone else’s past. She is at times a little too stiff and snooty, but then that’s a key part of the story – Melanie believes herself above these people she finds herself surrounded by, and that’s one of the obstacles she has to overcome to understand what’s going on. It works brilliantly as a horror story because at first you think the only question is when will she get back to her own present, but then you gradually realise that the details of Milly’s situation mean there are other dangers here. It’s genuinely scary, which is not something I say often! Marghanita Laski was a fairly well known member of the British literati who was nearly forgotten all too quickly, until Persephone Books republished this. They have subsequently picked out three more of Laski’s books for reissue. I am so grateful that there are outfits like Persephone out there preserving great literature for the future. First published by the Cresset Press in 1953. 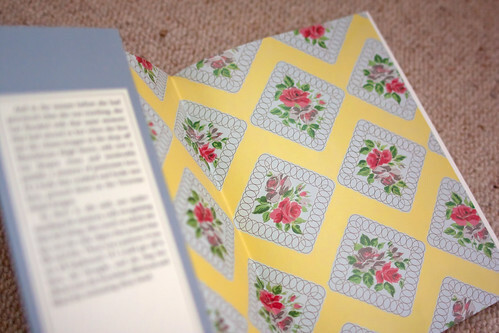 This edition published by Persephone Books in 1999. This is one of those greatly revered classics that made people look on with admiration while I was reading it, but actually isn’t a particularly hard read. It’s also not the most engaging, but it is full of Big Ideas. And that’s both its strength and its weakness: this is an intellectual exercise more than it is a piece of entertainment. 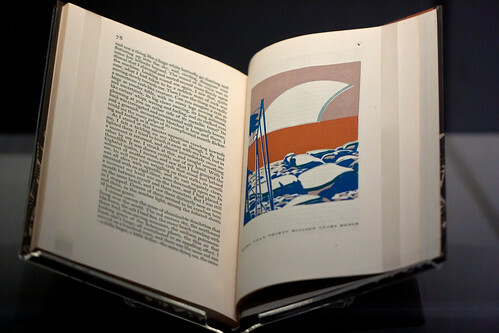 Wells was a scientist and drew on new exciting ideas in science to create a vision of the future that in its time would have been shocking, provocative, beyond credible and startlingly different from anything else, whereas now the science is widely known and accepted, what is left is a slightly bald political parable. Somehow I came to this without really knowing the story. I mean, I’ve seen and read references to it (both Family Guy and Futurama have episodes devoted to this story) but I hadn’t seen any of the film versions or read a synopsis so some of it was a surprise to me. The Time Traveller (as he is known throughout the book) has gathered together a meeting of London intellectuals to tell them about his new invention, the Time Machine. When they don’t believe him, he tells them to come back a week later when he will have seen the future, and it is his account of this trip to the future that forms the bulk of the novella. The format is slightly odd, in that an unnamed (indeed, un-anything) first person narrator attends these two meetings and records them in a manner somewhere between a journalist and a scientist, so that it’s fairly dry but with the occasional interjection of emotion. The first thing that struck me was that this isn’t that familiar narrative of jumping a few years at a time into humanity’s future, finishing with a quick trip to the end of the world. The Time Traveller jumps straight beyond the human race as we know it, to the year 802,701 AD, and most of the story is set in that one time (though there are a couple of further jumps forward). In this future, human beings have evolved into two distinct species – the gentle, childlike, darkness-fearing Eloi and the ominous, monstrous-looking, light-fearing Morlocks. The Time Traveller can only conjecture how these races came to be and recounts more than one theory that he subsequently rejected upon further observation. This means that we cannot necessarily trust the Time Traveller’s interpretation, and indeed his descriptions are a little sparse. Can we be sure that these creatures are all that human-like? When he acquires a female Eloi companion he tells us that she is called Weena and she is really the only character to have a name, almost as if he is trying a little too hard to humanise her. I will admit I was more scientifically interested in the descriptions of the further future, with geological timescales having passed, where Wells describes not only an ice age but also changes to the Sun, the Earth’s orbit, various stars, the Moon, tides, even other planets in our solar system. He was building on recent discoveries in physics and this description was no doubt just as revolutionary (and possibly just as provocative) as his evolved humanoids, but it is also beautiful. The story of the Eloi and the Morlocks is essentially a sad one but the continuation of Earth through immense changes in the solar system is somehow uplifting and inspirational. As a story, I was a little disappointed in The Time Machine – I didn’t find it engaging, the characters are deliberately insubstantial and many of the ideas no longer appear original or daring. However, it is still a clever, inventive take on the travellers’ accounts that it is built on. This is a book I had been meaning to read for a long time. I bought it, some people recommended it, and I got excited and lined it up for the recent 48-hr TBR read-a-thon. Then someone else told me it was really hardgoing and I got scared of it. Then some lovely people on Twitter encouraged me to give it a go anyway so I did. Yes, it’s a little crazy but it is a great great book. There are no surprises in this book. Everything is laid out in chapter one, which is actually a sort-of prologue, or a “Why I wrote this book”. Vonnegut’s style takes a little getting used to. It’s chatty in a realistic kind of way, by which I mean that it’s not always fluid, jumping around between subjects, but not in a stream of consciousness way. The central story is that of Billy Pilgrim, a WWII soldier, prisoner of war, optometrist and time traveller. At least, he says that he was kidnapped by aliens on the night of his daughter’s wedding and ever since has been able to travel around in time the way they taught him to. This allows his life story to jump around in time, only dealing with the horrors of war in small chunks. I was never entirely clear how seriously we’re supposed to take the time travel thing, or whether Billy himself really believes it. But it makes sense for a person whose whole life has been coloured by the awfulness of witnessing the Dresden firebombing, who was institutionalised and became a fan of cheap science fiction, to latch onto this coping mechanism. Despite the tough subject matter and obscure manner of storytelling, this is a tender, funny book. 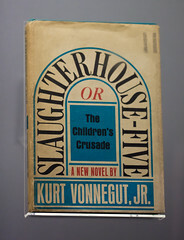 It is moving and also oddly innocent – Vonnegut’s subtitle is certainly apt. He shows great sympathy for dogs, horses and children, which challenged my assumption that a war veteran would be hardened emotionally.